When Nil Zacharias planned a trip to South America in 2010, he knew very little about food beyond his plans to try the Brazilian grass-fed beef that his friends had recommended. But after a tour guide told him about the rainforest destruction caused by various food industries, Zacharias came home, began researching our food system, and unknowingly started a six-month transition to an entirely plant-based diet. The more he learned about how the food he was eating made its way to his plate, the less appetite he had for it. Nine years later, he’s one of the most recognized names in the good food movement. Zacharias is the co-founder and editor-in-chief of One Green Plant, an online platform for eco-conscious news and resources. Since launching the site, Zacharias has also created an interview podcast called Eat for the Planet and co-written a book by the same name. The podcast, which showcases the stories of change makers who are working on specific solutions to our broken food system, has given Zacharias the unusual position of being able to interview the leading lights in the plant-based food space. Zacharias told us that he chooses podcast interviewees who approach the problem in their own unique way and can inspire others through not only their work, but also their personal journeys as entrepreneurs, investors, health experts, and nonprofit leaders. With 79 episodes under his belt, Zacharias has gained unique insight into some of the most exciting solutions and innovations in good food and become a visionary in his own right. Last year, Zacharias collaborated with Gene Stone, author of the bestselling book My Beef with Meat, to publish a book called Eat for the Planet that offers new research, compelling infographics, and a lucid, accessible argument that adjusting our diets is one of the most effective steps each of us can take to improve the planet and our health. With its small size and internet-era aesthetic, the book speaks to a generation of readers who may have good intentions but lack the information that Zacharias sought in the beginning of his own transformation. We recently sat down to interview the interviewer and get his take on some of the change makers and innovations that are giving him hope right now. SPP: What trend or issue in the plant-based space are you feeling most excited about these days? NZ: The plant-based and cell-based agriculture space around replacements for animal products is what’s most exciting. There’s so much work happening there, whether it’s in the research that’s being done at several new tech startups to take animal cells and turn them into meat, or companies using plant proteins to develop products like the Beyond Burger or Impossible Burger. There are also people using fungi, yeast, and other sources to culture them and turn them into end products that resemble eggs or milk. I think the closer we get to making better foods taste and cost the same, and making them easy to find, whether it’s in fast food restaurants or any grocery store, the quicker we’re going to be able to bring about change. These foods and technologies have the potential to get people to change the way we’re eating without even realizing it. Are there any podcast interviews that stand out in particular? Matt and Cierra DeGruyter, the founders of Next Level Burger: They have such a bold plan for their business, which is to basically replace McDonald's as America's go-to fast food burger joint. And they approach it with so much enthusiasm and joy that it makes you really want to root for their success. They are as genuine as it gets, and you can really tell their mission is to leave behind a better planet and transform the health of so many people. Capt. 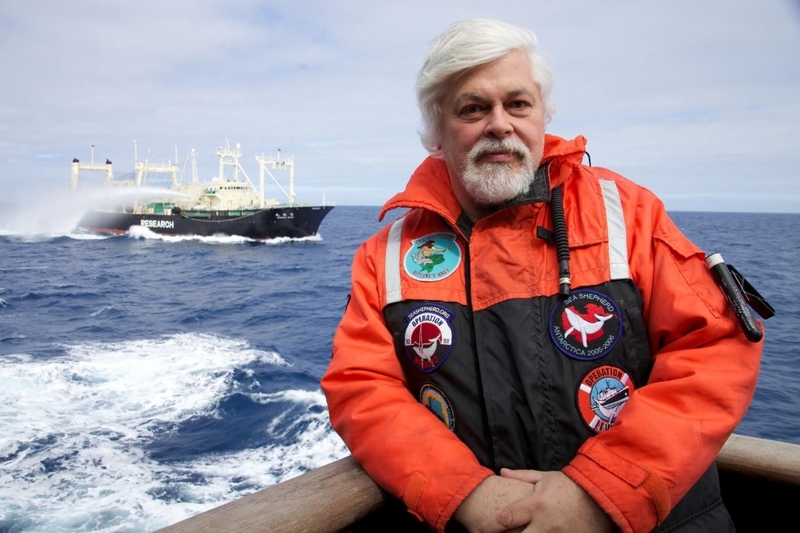 Paul Watson, founder of the Sea Shepherd Conservation Society: I've admired Captain Paul Watson's work for years. He really tells it like it is when it comes to the devastation facing our oceans, a topic that generally goes overlooked. It's great to speak to someone who has been fighting for an issue their entire lives and is probably as relentless and passionate as they were when they started. There’s a question you ask all of your podcast guests: “Look ahead and imagine 2050. If things go well, what does the world look like to you?” What would your own answer be? My answer would be that very likely in 2050, people will be eating less meat produced by factory farms. I think that’s a guarantee. I also think people will be choosing more plant-based and cell-based meats. People are also going to incorporate more whole plant foods in their diets because I think the health benefits of eating mostly plants are well documented at this point. You don’t have to be a vegan, but if you eat at least 80 to 90 percent whole plant foods, you’re going to see some remarkable changes in your health. Secondly, I think we’ll finally see a world where we’re going to be using technology to create foods that actually nourish us in convenient ways. That’s what tech needs to be used for in the food industry instead of what it’s been used for in the past, which is to engineer foods to taste great and have absolutely zero nutritional value. Food technology will finally be used for good as opposed to making a new tasty Pringle or Doritos chip. And I think if those two things happen, the third is natural. I think we’ll have a healthier population of human beings on this planet living in greater harmony with the natural world around us. For instance, I was recently talking to someone about cellular aquaculture (which is another word for clean, cell-based meat for fish), and he said that it’s not so much that by 2050 we won’t have a fishing industry. There will still be fishing, but there will also still be fish in the ocean because at that point there will be an option to eat seafood that has been produced through cellular aquaculture. In the case of meat, who knows? Maybe there will be an end to factory farms completely, and conventionally grown meat will become this rare thing that’s very expensive. As publishers, we’re of course curious about your recent book project. What was the appeal of the book format for you, and how did you think about your book’s role in contrast with the podcast or website? I had a pretty good understanding of online media, and I felt like we’d done a lot with One Green Planet. But frankly, I believe in books. No matter how many online articles I wrote or talks I gave or podcasts I did, I think a book has the ability to reach more people. I think books are still relevant, but I think books need to evolve also. Books tend to fall into patterns that can get a little predictable, and our goal with the book was actually to reach people who don’t like books. We knew the challenge was that we’re communicating a subject that’s full of research and science. The only books that had touched on industrial agriculture were all very dense, wordy scientific books, so we decided to do the opposite of that with appealing graphics, accessible language, and a book that can fit in your pocket. The book is mostly about helping people understand the problem; the podcast is about helping people share their solutions. Takeaway: To learn more about the interviewees and innovations that Zacharias’s organization highlights, visit eftp.co or check out their instagram page @eftp.co.